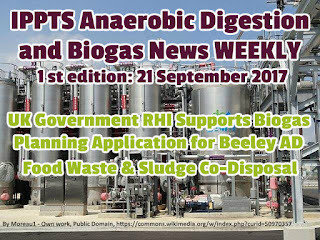 It’s Friday the 29 September 2017, and this is Issue 2 of IADAB News Weekly, where we summarise the most important news of the week in the developing world of the Anaerobic Digestion and Biogas Industry, in the UK and globally! Alright, let’s get started… This week's news, has been all about food waste, feed-in-tariffs. We did not plan it that way, but when researching this weeks articles we simply found it has coincidentally been the topic of the week. According to WRAP what can be done to reduce this waste. Last but not least; How in New York the development of food waste Anaerobic Digestion facilities is transforming organic waste into fertiliser and clean energy. How a Young Staffordshire Farmer is establishing his own AD Business, all before he reaches the age of 30. Britcon has successfully completed on the contract to deliver a new, £32m anaerobic digestion (AD) plant in Dagenham for food waste recycler ReFood (UK) Ltd. The new £32m plant in Dagenham is the most advanced integrated AD plant dedicated to food waste in the south of England. The gas to grid (G2G) facility is capable of recycling 160,000 tonnes of food waste each year generating 14 million m3 of biogas. New research from WRAP, published today, has highlighted the significant financial, environmental and efficiency benefits inherent in tackling food waste in primary production, as it showed that an estimated £30m of UK strawberry and lettuce produce ended up as waste in 2015. When it comes to food and the sheer volume discarded annually, the United States reportedly ranks as one of the largest organic waste generators in the world. Each year, the United States discards up to 60 million tons of produce, according to a recent estimate. Businesses in New York City alone send about 650,000 tons of food waste annually to nearby landfills—a staggering and extraordinary amount of organic material that the city is aggressively trying to manage. Instead of dumping the waste in landfills, scraps are diverted to organic waste sites and transformed into renewable energy. One such company doing just that is Yaphank-based American Organic Energy (AOE), which New York Gov. Andrew Cuomo credited as a model for harnessing renewable energy. AOE will accept 180,000 tons per year of food waste, 30,000 tons of fats, oil, and greases, and an additional 10,000 tons of gas clippings. Charles Vigliotti, AOE’s chief executive, told The New York Times Magazine that the biogas produced at his facility could generate an astounding nearly 50 million kilowatt-hours of electricity per year. This newly harnessed energy will help power his facility, can be sold to an electric company, and may also be used to fuel its fleet of trucks. In the course of 2017, Ireland intends to initiate their energy reform with a new feed-in tariff for renewable energies. The government plans to increase the amount of green electricity from the current figure of about 23 percent to 40 percent by 2020. The tariff system is to establish a favourable environment for biogas plant operation. In view of the extensive agricultural and waste resource potential available in Ireland, WELTEC BIOPOWER UK will showcase its AD plant technologies at the Energy Now Expo Ireland, which will be held in the end of October in The Hub in Kilkenny. Young Farmer Rob Greenow has successfully established his own AD business, allowing him to secure his future in agriculture, all before the age of 30. Combining an interest in renewable energy with his farming experience, Staffordshire-based Rob established AD management business, BioG UK, just a couple of years after leaving university. “While studying at Reading University I completed my dissertation on ammonia volatisation and the spreading application types of digestate from AD Plants,” he explained. “At the time AD was only just becoming popular in the agricultural industry but I could see the future potential. So, after graduation, I joined an AD company and was involved in the planning and running of various sites. Although Rob intially hoped to support farmers through the feasibility and planning stages of an AD plant build, he found that the business soon changed direction. “After two years I shifted the focus of the business to concentrate on helping existing AD plant owners troubleshoot and manage their plants," he said. “And in 2016 I completed the purchase of my own 162-acre arable farm. This was around the same time two years’ worth of planning came off for the development of my own AD plant at Batchacre Hall Farm, Staffordshire.". ADBA has placed an update on their Best Practice Scheme for AD Plant Operators. They say their pilot which was set up to test the scheme, has now been completed, which means that they are on-track to open the scheme to AD plant operator applicants autumn/winter 2017. Like, subscribe and leave a comment. Join our news letter subscribers! Acknowledgement to Weltec Biopower for the images used this month. It’s Thursday the 21st of June, and this is our very first issue of IADAB News Weekly, Edition 1! 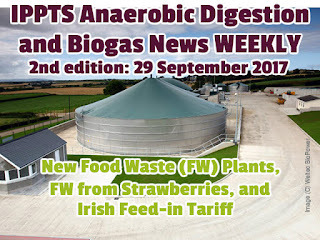 It's free, and our mission is to bring you the latest AD and Biogas news in a concise form. 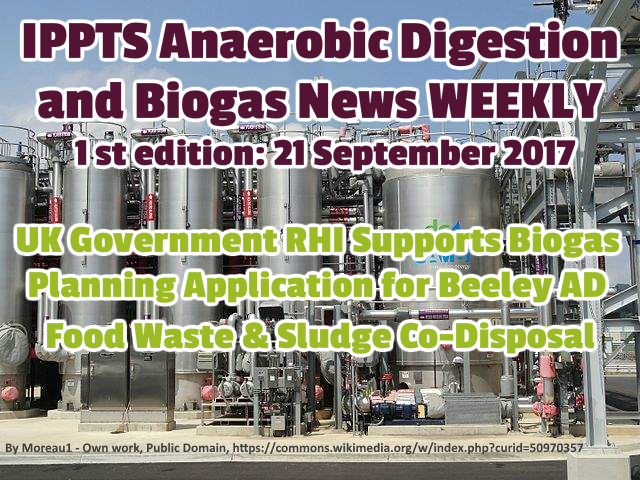 We aim to keep all our subscribers informed of the latest developments in the anaerobic digestion and biogas industry in the UK and globally. In today’s news we have a new planning application announced for a biogas plant to be built on a brownfield site in Sheffield which seems to tick all the boxes for sustainability. We can say that because we are told that the feedstock will be food-waste, and that the biogas will be upgraded to biomethane. We also assume that the high efficiency plant will be one of the current breed of the most efficient type of AD energy uses, that being direct injection into the gas grid. The developers of the Beeley AD Plant, will no doubt be be relieved, by the UK Department for Transport's (DfT's) response to its consultation on the Renewable Transport Fuel Obligation (RTFO) which we cover in our second featured article. 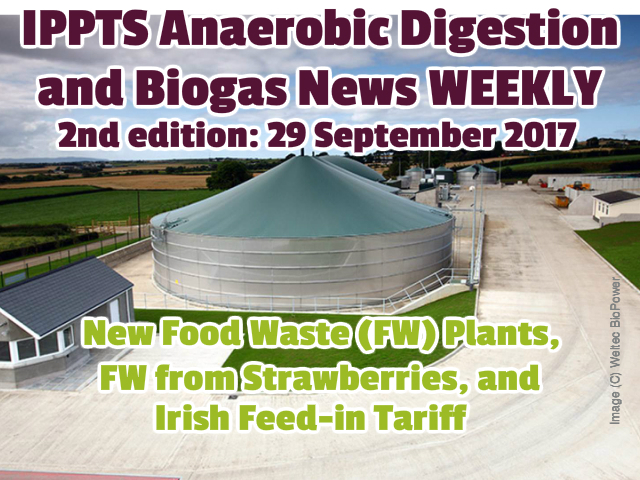 In our final excerpt, we report on an academic investigation in progress on the anaerobic co-digestion of food waste with sewage sludge. We do so, because we like to emphasise that Anaerobic Digestion is still a young discipline and that the technology is likely to develop much higher process efficiencies through research of this type. Plans have been submitted to develop an anaerobic digestion plant at the Beeley Wood Sustainable Business Park in Sheffield to replace a WWII-era factory and generate enough gas to power 2,500 homes. Plans put together by Pegasus Group on behalf of Beeley Wood Biogas Ltd detail have been submitted to Sheffield City Council to redevelop the land bordering Beeley Wood in the Don Valley. The site was formerly used by Union Carbide in the aftermath of World War II to produce carbon electrodes for the steel industry, graphite rods for the nuclear industry and related industrial products. The UK's trade body for anaerobic digestion (AD) has welcomed the Department for Transport's (DfT's) response to its consultation on the Renewable Transport Fuel Obligation (RTFO), declaring biomethane to be perfectly positioned' to meet increased targets for renewable fuels. DfT's reforms will obligate fuel suppliers to provide 9.75% of all fuels from renewable sources by 2020, a doubling of the current 4.75% obligation that will then rise to 12.4% of all fuels by 2032, helping to align the RTFO with the Government's Carbon Budgets. Biomethane produced through the recycling of organic wastes and energy crops is one such fuel derived from renewable sources that can help fuel suppliers to meet this new higher target, particularly for heavier vehicles for which electrification is impractical or expensive. With more than 80 AD plants across the UK already producing biomethane, the UK AD industry has sufficient capacity today to produce enough biomethane to power 80% of the UK's entire bus fleet and the potential to produce enough biomethane to power 75% of all HGVs in the UK. It can also be used directly on farms to fuel agricultural vehicles. ADBA greatly welcomes DfT's increased commitment to supporting low-carbon fuels, which are essential for decarbonising the UK's emissions-heavy transport sector and meeting our Carbon Budgets. The rising of the obligation for renewable-sourced fuels to 12.4% by 2032 goes beyond what was originally consulted on and will create a positive investment environment for renewable fuels. As a low-carbon, low-cost, and technology-ready transport fuel that can deliver £2.1 bn in CO2e savings per year and dramatically improve air quality, biomethane is perfectly positioned to play a leading role in helping fuel suppliers to meet these increased targets. In this laboratory-scale investigation on the applicability of the co-digestion of food waste with sewage sludge, evaluated were the effects of the single-stage versus two-stage operating modes at the hydraulic retention time (HRT) of 15 days, and the impact of HRTs: 15 days vs. 25 days, on the single-stage operation. via Investigation on the anaerobic co-digestion of food waste with sewage sludge. We anticipate that our readers, just like ADBA will welcome the UK's DfT's increased support for low-carbon fuels, and in other nations globally this news will perhaps help to reinforce UK government statements that the UK will continue to support its decarbonisation commitments. 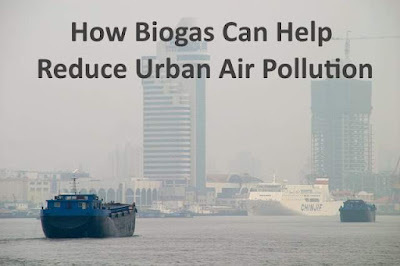 This short video explains how biogas can reduce urban air pollution. 1- Gas powered vehicles emit far lower Nitogen Oxides, known as NOx, and particulate matter than their diesel-based counterparts.By transPublish Postitioning away from petrol and diesel fuels to biomethane, cities can achieve both GHG emissions reduction and improved air quality.This has already been done successfully for some vehicle fleets in some cities including Lille and Berlin. 2. Replacing other fuels with biogas use can reduce Fine Particulate Matter in urban air in developing countries. Over 30% of fine particulate matter in the urban air in Central and Eastern Europe and Africa originates from domestic burning of solid fuel such as wood and coal for heat and cooking. 3. Replacing wood with biogas as domestic fuel would almost eliminate particulate matter emissions from this source. 4. Replacing coal with biogas for electricity production would nearly eliminate particulate matter emissions and reduce carbon dioxide emissions by over 40%. 5. Diverting organic waste away from landfills may improve air quality around the landfill, and in particular can reduce odours. 6. By collecting and using food waste, or the organic fraction of municipal solid waste, for the production of biogas energy, cities can improve air quality.This is because biogas plants not only generate their own renewable power via biogas, but can also be used to dispose of the waste, which will no longer be sent to landfills. 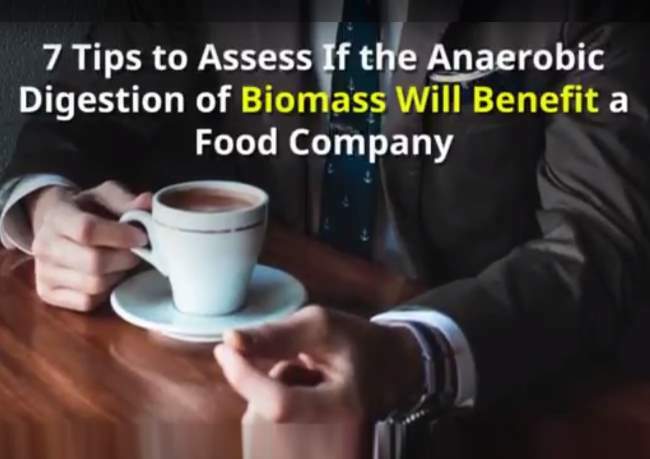 Food Processing companies should use these 7 Tips to make an assessment of whether their business can benefit from the Anaerobic Digestion of Biomass. The fact is that anaerobic digestion of biomass can be of real benefit to some food companies which prepare food products of all types. Waste biomass has a value when it is used as the feedstock for an anaerobic digestion plant, but these companies often don’t appreciate the biomass asset which hides unseen, in the highly organic content of their food processing waste. Food companies are not only unaware that they can make money from the anaerobic digestion of their biomass, but what is even worse is that the chances are that disposing of it is costing them a lot of money. which calculates costs according to the volume and strength of their waste water. Like other industrial companies that discharge waste water into the sewerage network, they should make a conscious decision whether or not, to invest, in an energy producing anaerobic digestion (biogas) plant. If they did they would be able to use the energy to power their food waste processing factory, and most likely sell some of it to their local electricity network (local grid company). Tip 7. Choose a contractor with a track record. It’s all about going back to basics first, having an intimate knowledge of what the waste profile is of the plant, and finally being courageous to change the way companies work. For those prepared to put in the investment, and work to collect the right data, and apply that to an in-depth understanding of their waste water and biomass waste issues the benefits can be amazing. such as an anaerobic digestion of biomass facility, there is a lot of opportunity out there. 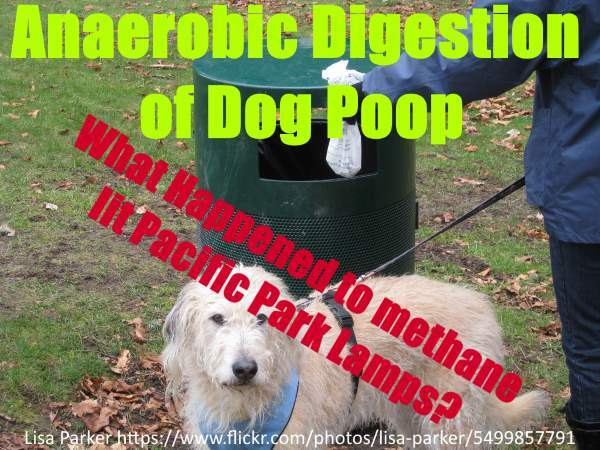 Anaerobic Digestion of Dog Poop Fuelled a Pacific Park Lamp - What Now? The story of anaerobic digestion of dog poop which at first simply lights a park lamp, but can do much more in future, is a fascinating story for its use in anaerobic digestion, to both render it harmless by providing soil improver/ a fertiliser after pastuerisation, and an energy source (methane biogas). To demonstrate this fact we have put together some of the articles on the subject which are available on the internet. If you are like many people you will be reading this with disbelief, and we don't blame you. How could all that smelly dog poop which is such a high disease risk, especially for children, possibly become a substance which can be useful? Note: The video says click the link below, but there is no need to click any links, because you are already here, on the full article page! The answer is through using the anaerobic digestion process in a new and very simple low-rate low temperature biogas digester, huge new possibilities emerge. Unfortunately, uptake for new parks, seems to have stalled as we explain below, but the idea is interesting. First, let us look at the typical research which confirms the potential of dog poop to feed anaerobic digestion plants. The potential of dog waste to produce biogas and/or enhance the biogas productivity of some other animal and plant wastes was investigated. From the trials it was concluded that... dog waste can be a source of biogas and a source of catalyst for prolonging the retention time of other waste samples such as field grass and cow dung. But, how much dog poop is available? So, the problem of dog poop exists, there is lots of it, and there are researchers that say anaerobic digestion will work, but is it already being digested? Is it being digested in biogas plants anywhere? (2012) The city of Waterloo in Ontario, Canada, will soon be home to a dog waste biogas facility, according to the Huffington Post. Dog waste from around the city will be collected and turned into energy using anaerobic digestion. It will be one of the first times such a program has been used in a Canadian city. Although already popular in smaller Canadian towns, dog waste anaerobic digestion has yet to be tested in a city of Waterloo’s size. Special ‘receptacles’ will be set up around the city which dog owners can put their dog’s waste into instead of a regular litter bin. The dog waste bins will be bright green, with a dog-shaped opening. "It's actually a big issue, dog waste. If you look at our municipal litter bins ... it's 40 to 80 per cent dog waste,'' Waterloo mayor Dave Jaworsky told the Huffington Post. The city has a population of about 100,000 people. Ah! Those Canadians can do it, but it is probably highly subsidised you say, given that this example is in Canada. It stinks and it's a hazard to walkers everywhere, but it turns out dog poop has a bright side. Dog poop is lighting a lantern at a Cambridge dog park as part of a monthslong project that its creator, artist Matthew Mazzotta, hopes will get people thinking about not wasting waste. Oh! But, this is only playing at producing methane, the doubters would say. City parks confronted with dog waste hope to turn the nuisance into a usable source of biogas. With the "Park Spark" poop converter is actually two steel, 500-gallon oil tanks painted a golden yellow, connected by diagonal black piping and attached to an old gaslight-style street lantern at the Pacific Street Park. We agree that to show that municipal authorities in wealthy cities are digesting dog poo successfully, may be one thing, but large scale take up of dog poo as a "green" energy source will not begin until businesses can do this, offer to take dog poo, and make money with it. That's why the Pacific park lamp articles are so interesting. Unfortunately, the park lamp biogas idea does not seem to have withstood the test of time. A company in Wales, UK, which was promoting the method in the UK, as shown by the following article, is not actively promoting this any longer on their website. The waste-to-lamplight stations are ideal in terms of public awareness and they could raise some opportunities for revenue from corporate sponsorships, but the real meat of Streetkleen’s business plan will be a network of Streetkleen waste disposal receptacles that come complete with biodegradable waste bags. Under contracts with local governments, the waste would be picked up regularly and taken to a commercial scale digester facility. Assuming that dog owners tune into the new system and use the special dog waste receptacles instead of putting the waste in with mixed trash, that could add up to quite a bundle. In the U.K., an estimated 1 million dogs generate about 1,000 British tons (tonnes) of waste every day. In the U.S. the economy of scale could really kick in. According to an ASPCA estimate, there are more than 1.5 million dogs in New York City alone. For that matter, dog waste removal is already starting to turn into a business opportunity, in the form of pet waste removal companies that serve homes and private companies, so it’s not a stretch to apply a similar model to municipal pet waste removal. Local governments would pay for the service, but at least some of that cost would be offset by diverting tons of heavy, soggy waste out of the general stream that would otherwise go to incinerators or landfills. The park lamp biogas method articles stop in 2013, so clearly a problem has occurred with this business model. Nevertheless, dog poop biogas production is moving forward now that there are many more anaerobic digestion food waste plants which can accept this waste for co-digestion with the food waste. Plus, Streetkleen was promoting a fascinating, and highly innovative business model, no matter what the outcome. Local authorities in the UK who are sending dog poop to landfill will be being charged at a cost of about GBP100 per tonne, so there is money to be had from accepting dog poo in anaerobic digestion plants, with suitable waste management licenses. If anyone reading this knows about the current fate of any of the park lamp biogas plants we would love to know what has happened since 2013? Are the original lamps still biogas lit? ESA says a Residual Waste Crisis due toa lackof sufficient capcity is looming for the UK, but independent consultancy Eunomia says the opposite. We suggest you visit our article at: http://landfill-site.com/uk-waste-treatment-capacity-crisis.html to read more on this subject.